Translator Speak and Translate Free (free) is a universal iOS app that translates spoken language bi-directionally in 66 languages. The app automatically detects the spoken language it hears and then provides translations. The app uses the Microsoft translation engine -- in my experience the Google engine is a bit better. The paid version of the app allows you to use either Google or Microsoft for translation. A dialog mode lets you communicate back and forth without pressing any buttons. The app offers repeated voice playback of any translated phrase, and you can set the bit rate of your recording for higher quality. The app also lets you set a variety of useful phrases in various categories, like shopping, sightseeing, health, etc. This would be a nice app for those learning a language, or its more obvious use, for travelers in foreign countries who want to communicate easily. I tried the app and it worked well in French and German, languages I have a pretty good grasp of. The other 64 languages weren't tested, but user reports are positive. Of course the free Google Translate app is also excellent, but doesn't work in the hands-off mode that Translate Free offers. The app is ad-supported, but the ads are not distracting. The ad-free "pro" version is also available for US$4.99 and allows you to switch between the Google or Microsoft translation engines. 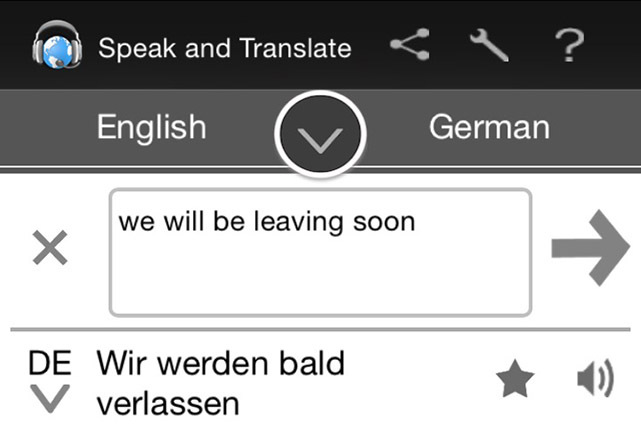 Translator Speak/Translate Free is a universal app that requires iOS 7 or later. It is optimized for the iPhone 5. Translator Speak and Translate Free gives you a simultaneous interpreter in your pocket originally appeared on TUAW: Apple news, reviews and how-tos since 2004 on Fri, 02 Jan 2015 17:00:00 EST. Please see our terms for use of feeds.